The Summer Gallery show at Omega is on and was mentioned in the FCA's Art Avenue magazine. I was up at the gallery on Tuesday with two friends who enjoyed the show. The gallery is looking lovely and fresh and everything was nicely displayed. I hope more people can get in to see it. Dunbar Street has it's challenging parts as construction goes on in parts, but there is parking on side streets. 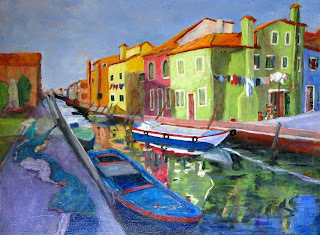 In a previous post, I showed one of the two new paintings I did for this show- the one of Burano. This is the other - the Christmas market in Trastevere, Rome. The star-lights are strung across the street. What interested me in this was the contrasts of light and the more shadowy figures and capturing some of the magical feeling of the market. What interesting items might we find for sale? Robert Genn's latest newsletter talks about drawing and its importance to artists. I totally agree. Life Drawing, especially, really helps keep up a person's skills in observation as well as in drawing. Lately, I have been drawing in three colours- in conte' or in charcoal pencils - black, white and sienna- to work on capturing tone values. I do them on a medium tint paper. This is a fairly "classical" way of drawing and I'm looking at realism, not so much interpretation. I'm just about finished the current pad of paper and I think I'll go to something more freewheeling for a while... more colour, playing more with variety in line, etc. Just a change to shake things up but the same actual *drawing* challenge is there- capturing a pose, the foreshortening of a limb, the way light falls on the body... The illustration here is one in coloured conte' of a 30-minute pose in the last Drawing Marathon. The promotion advice newsletter that I get said to post on Google as it would work for a person by coming up first on a search - so I did. I picked a photo of me in the Czech Republic coming out of Karlstein Castle - that is my "castle owner's smile" - maybe! At any rate, the Google listing is interesting because it brings up all the painting photos from my website. Time will tell if there is any value to it. I also survived posting photos of the Fraser River Art Festival to the Richmond Artists Guild blog. I found it a bit more difficult to do than this blog but I must be getting more computer savvy because I *did* manage to do it! I delivered my paintings to Omega this morning. The gallery is looking lovely and fresh and even has a new floor. My paintings include the one of Burano from the last blog and this one of the Estates Theatre in Prague. This is just a little painting (10" x 8") that I did to try to capture the magic of an evening at the opera. This is the same theatre where Mozart premiered "Don Giovanni". (And conducted it ) If you saw "Amadeus", you saw the inside of this theatre. The amazing thing is that it is still the same- with electricity substituting for candlelight-but still with the beautiful boxes and their gilt cherubs and drapery. When we were in Prague, we went to this theatre, sat in a box - and even saw and heard "Don Giovanni". People do dress up - at least to the extent of nice clothes and no jeans. I didn't see anybody there in full evening dress. Nevertheless, it was a very elegant evening. Each box has a mirror that reflects another box - this was so some subtle flirting could go on without having to lean out and be obvious to others.I'm not sure how a person could arrange to be in a box with the mirror reflecting the object of their affection- but I'm sure it was worked out. I used our reflected box to do another sketch. Not as romantic, but I enjoyed myself. Festival by Britannia for the BC Day weekend. Today is Canada Day but I didn't go out to any events. I had a quiet paint-in, mowed the lawn and did some other garden work. Next week I have to organize what I am taking to the London Farm event and pack up the paintings for Omega. For Omega's Summer Gallery, I will be showing some of the European paintings - and I've done two new ones! This is one of Burano, island by Venice, which is a new painting.